Oakland Wood Floor dustless wood floor refinish system is healthier, better and faster for you. 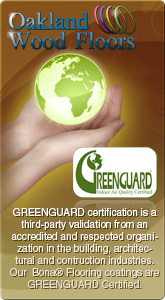 Our top coatings are GREENGUARD Certified. 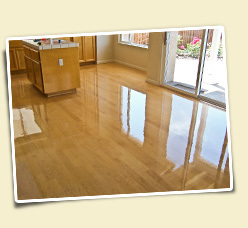 Prices for dustless floor refinish start $2.99 sqft in the east bay area. akland Wood Floors is the Bay Area's source for high-quality wood flooring done right. Our knowledgeable sales staff can help you find the right hardwood flooring to match your budget. Our skilled flooring installers provide you with an efficient installation and leave you with a beautiful hardwood floor that will last for years. Refinishing your wood floors will make it look brand new. 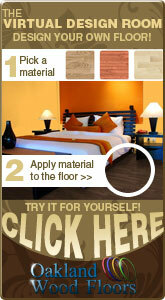 You can change the color of the wood floor without replacing the wood flooring. The problem is that sanding and refinish wood floors can be a dusty process. However, Oakland Wood Floors uses a dustless wood floor refinish system from Bona that captures 99 percent of the dust created by sanding. Oakland Wood Floors also uses Bona products for the finish because Bona has proven to be one of the more durable flooring products as it is fast drying and emits no strong smell. 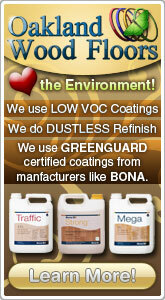 Further, our dustless wood floor refinish coatings are low VOC. If your hardwood floor just needs a refinish but you don't want to deal with the sanding and the dust, then our No Sanding hardwood floor refinish is the flooring service for you. Oakland Wood Floors will chemically abrade and refinish the wood floor top coat, requiring no sanding. Our no sanding hardwood floor refinish for wood floors removes wax, old wood floor finish, and cleaners that have built up on the hardwood floor. The finish can then be reapplied to give the floor a new look. No sanding hardwood floor refinishing will also remove deep scratches and small gouges. It is also faster than a full refinishing. Our No sanding hardwood floor refinishing system in some cases, will not remove excess deep paint or excess glue. If your floor has either of these problems, we recommend going with our dustless wood floor refinishing. 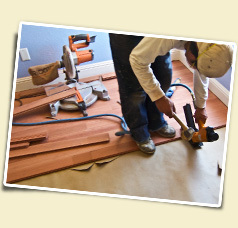 Hardwood floor installation is more than simply laying down the new flooring. 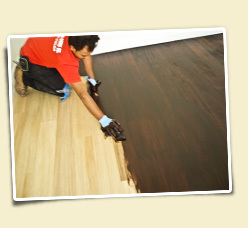 Our professional and experienced Hardwood floor installation crews will give you a long-lasting floor. They make sure the subflooring is flat and clean before the installation begins and the acclimation time for the wood floors is the right time. The installation will only be as good as the subfloor and the experience of the hardwood floor installation crew. The installers use the latest tools and techniques to give you the hardwood floor installation you want. While natural wood is beautiful, sometimes it just doesn't go with the décor of a home. At other times, the color of natural wood can vary from piece to piece. Staining provides a uniform color that will enhance the beauty of your home. 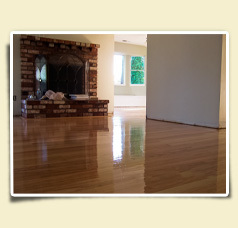 Oakland Wood Floors offers more than two dozen custom and standard wood floors stains. Oakland Wood Floors can even match existing wood floor stains. 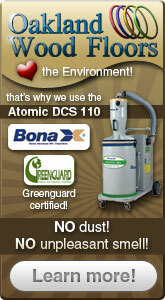 We use low volatile organic compounds (VOC) that are more environmentally friendly. Staining your hardwood floors can be done in a day or less. As a member of the National Wood Flooring Association, you can be assured that Oakland Wood Floors' employees are up to date on the latest products, services, and trends in the industry. Oakland Wood Floors rated the Best of the Bay Area Winner of 2008 in SF Gate.